There is only one truth from Super Saturday that the Coalition will need to confront before the Federal election: Shorten won and Turnbull lost. So no changes to the Parliament and most importantly, no real effect on the Government, either way. And as necessary corollaries, no early election and no leadership spills. PM Malcolm Turnbull and Opposition Leader Bill Shorten can forget their immediate concerns, for the moment at least, and go back to what they do best — abusing each other. In the Prime Minister’s case, this has become something of a vocation, if not an obsession. As the climax of the campaigns approached, his screams of liar, liar, pants on fire! became progressively shriller and less coherent. And, it appears, less convincing. Which is why, despite all indications to the contrary, Super Saturday was not merely Status Quo Saturday — as the estimable Peter Hartcher rechristened it. Turnbull’s "Kill Bill" approach has now demonstrably failed — most crucially in his most vulnerable State, Queensland. The catastrophic collapse of the LNP vote in Longman at the hands of both Labor and One Nation cannot and will not be ignored. And to attempt to fix it and the other five marginals in the Sunshine State, will require not just a bit more tweaking of the message but a major revamp of just about everything. And when Turnbull ranted on about Shorten’s connections with the unions, especially the dreaded CFMEU, it was even more of a turn off; why did he want to talk about their issues instead of his own? It all fed into the narrative of the Mr Harbourside Mansion, the ex-banker multi-millionaire who is hopelessly out of touch with the ordinary, hard-working Australians he governs. Then there is the hands-on Turnbull – the man in the fluoro vest or the hard hat or both – who invades carefully selected small businesses and interrogates the complaisant owners about how much they love his Government for showering them with largesse. Quite apart from the fact that such occasions are clearly staged and inherently improbable, for most workers, they miss the point: it’s all very well for the boss to be doing well, but how about a wage rise, or perhaps even moving from casual to permanent shifts? And the long-running push for corporate tax cuts was always unpopular but has now become poison: Shorten’s Longman line about money for hospitals and not for banks has almost certainly despatched it for good. It will be a difficult backflip for Turnbull to negotiate and will be seen as a betrayal by some of his colleagues, including the indefatigable Finance Minister Matthias Cormann. But it has now become a matter of survival. And finally, there is Turnbull’s big picture campaign, the one he relied on to replace Abbott with such bravado but which now, like everything else, has become problematic. We don’t hear much these days about "innovation" and "agility", it’s more about just keeping going — and hanging on for the very long haul. These big policies were enshrined under the slogan "Jobs and Growth", which Turnbull boasts as his great success story; but really only half of it is true. There have been a lot of jobs created, although the boom is now stalled — in that sense, there has indeed been some growth within the jobs market. But the wider economy is still pretty flaccid: the Reserve Bank inflation measure is still a long way from becoming sufficiently positive to push up interest rates. And of course, the biggest worry, as the bank has confirmed, is the continued stagnation of wages. Turnbull’s solution is classic trickle-down — pass the corporate tax cuts and all will be well. If there was a hope that this was going to sway the masses, last Saturday should have dispelled the illusion. Turnbull is hardly a natural retail politician, but if he is to reconnect with the voters who had such high hopes for him all those years ago, he would be wise to spend more time with the employees and less with their bosses — there are, after all, a lot more of the former than the latter. Our leader was happy enough to agree that the by-elections were at least partly a test of leadership; of course, he meant Shorten’s rather than his own. And he has no intention of resigning after Saturday’s voters rejected him in four States, so the referendum between the two has been declared invalid. But it cannot be denied that Turnbull and his chosen candidates are, at the very least, diminished. Big Trev (Ruthenberg) has shrunk, Middle-sized Brett (Whiteley) has dwindled and Little Countess Georgina (Downer) has been reduced to the commonality. 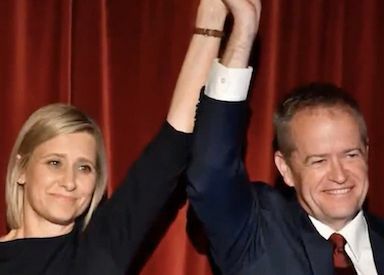 Shorten calls the result a "signpost" to a Labor win in a general election — which is a fair call, but it is only a signpost, not an irresistible surge. The point is, that after all the sturm und drang, nothing much has actually changed and in Turnbull’s case, it has to — and quickly. Millions of words will be spent analysing the outcome but or the moment, there is just one undeniable truth: Shorten won and Turnbull lost. That is the harsh reality the Coalition will have to confront as it prepares for yet another poll — this one being the only one that counts.